Featuring the amazingly well balanced Malik dribble curve shape shaft, a orange so bright the Dutch would have to wear sun-glasses to look at it and for me one of the most perfect composite mix available, welcome to the review of the Malik Naranja hockey stick. Playing in the middle of the field I like to know I have complete control of the ball and options on how to get it forward. Malik dribble curve shaft shape is so well suited. Moving forward with the Naranja you can keep the ball in full control, the bow position at 270mm up from the heel is high enough to be able to dribble effectively, while low enough to pick through tricky situations. The Naranja from Malik has a great 75% carbon, 15% fibreglass and 5% aramid mix that for me is a great balance between stiffness of carbon and feel from the lighter fibreglass. This gives a softness for close control and power for hitting the ball hard. Because the curve in the Malik Naranja review is 24mm it still performs great for pushing the ball and is one of the best hockey sticks I’ve ever used for chinks and close 3D skills. Available in extra light and light one of the best things to review about the Malik Naranja is its weight. 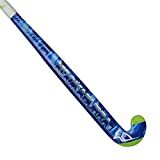 I like light weight hockey sticks because they don’t make my arms burn after a tough game, what I noticed about the Malik Naranja was how the weight also contributed to the power I could apply to slap hits. Being able to swing the Malik Naranja so fast allows you to connect with the ball at great pace when slap hitting and the ball leaves the stick at significant speed. Hitting the ball with the Malik Naranja is enhanced by the new carbon wrap around the stick. Since providing a review of the Osaka Series3 my colleague has been going on and on about how this makes a difference to his play. I noticed it immediately with the Malik Naranja. There is an audible difference when hitting the ball with a stick that has a carbon wrap. In the manufacturing of the stick Malik (and others) concentrate on layering carbon on the outside of the hockey stick which gives this additional power through the ball. There is no way I can leave this review of the Malik Naranja without mentioning the design. When creating the current range Malik obviously tried to contain their outrageousness a little. After just two sticks though, they got to the Naranja and could hold it back no more! Where the black background is beautifully dotted with the carbon weave effect and even the big Malik logo on the front is in crisp white, you turn the stick around to reveal the super bright, ultra cool Orange logo on the reverse as if to leave a reminder for the player you just danced around as you fly forward upfield. Picking the best of the Malik hockey stick range in 2015 is a tough job, for me perhaps the overall mix of technology in the Malik Naranja balanced with the price, makes the Naranja my favourite stick. Features: Carbon wrap on outer layer of stick.